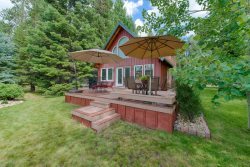 McCall Idaho Vacation Rentals is locally owned and operated by people who love to live, work and play in the McCall Area. We live by the "work hard, play hard" rule. To ensure our guests and owners experience the best service from us, someone from McCall Idaho Vacation Rentals is always working hard should another partner happen to be off playing hard. We're available 24/7 for any unexpected situations or to simply answer any questions and help create your perfect mountain getaway. Looking for more information or a personal call? Fill out the form below and someone will be in touch.